Doing something you’ve never done before can be scary, whether its standing in front of an audience, or having your performance scored. Trailblazers face all kinds of self-doubt on a daily basis. But what helps them overcome their fears and achieve greatness? Training and support. That's why we're inviting all SMS participants to a series of events - sessions to help you find your feet, get comfortable with new faces, and learn from experienced actors. The production team will be there at all events to clarify any questions you may have. Don’t worry, we won’t be doing cheesy icebreakers. Everything you’ll experience at our events are designed to help you in practical ways to build your confidence and prepare for your performance. 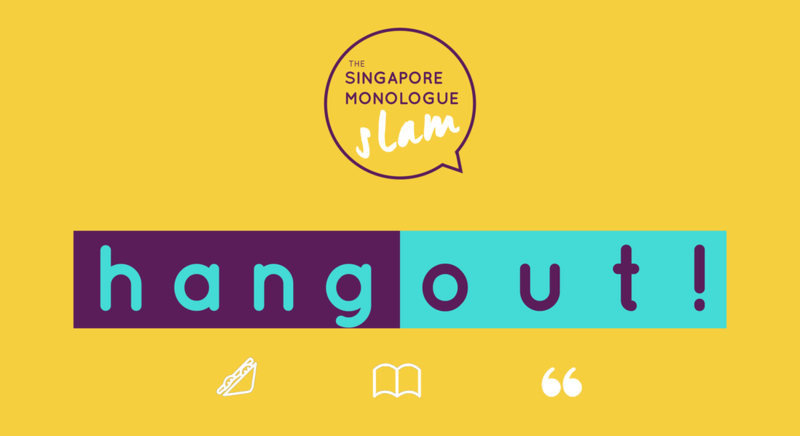 Whether you need help choosing a monologue, or want to practice performing in front of a friendly audience, you can find what you need at the SMS Hangouts! 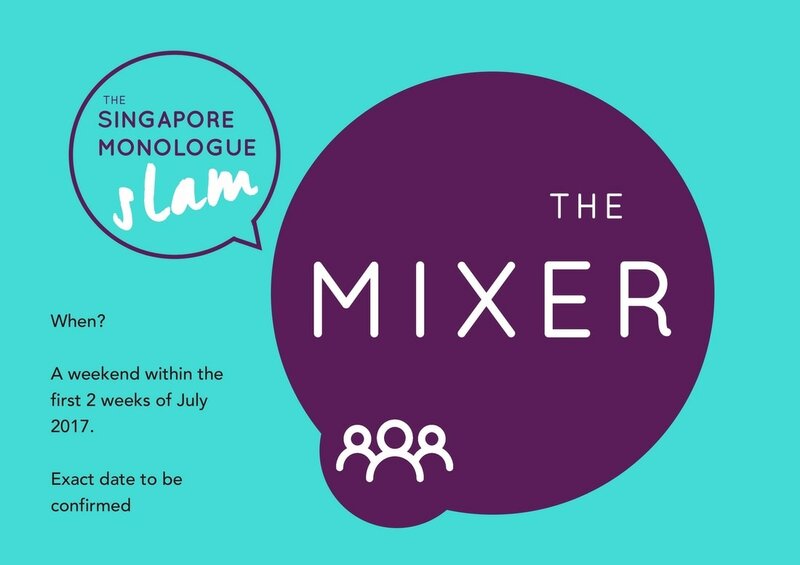 This is a casual meet-and-greet session for all prospective participants of the Singapore Monologue Slam. Facilitated by our producer, Kamil Haque, you'll receive personalised feedback, performance tips, and writing help. Food and drinks will also be provided. Writing your monologue can be difficult. From finding your character's voice to conceptualising a script from scratch, we're here to help you. Get the help you need at the SMS Gym! 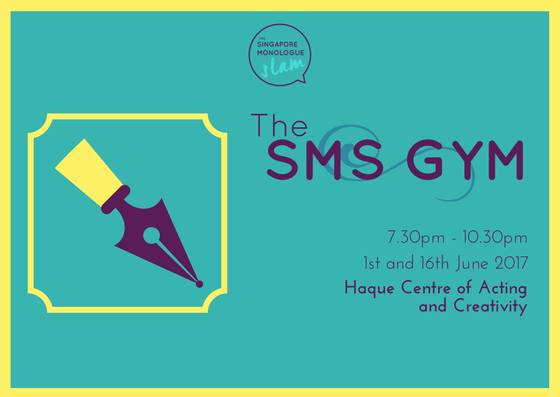 An intensive writing workshop conducted by our producer, Kamil Haque, the SMS Gym is here to work those brain muscles and get your pens working. Here, you will receive exercises and advice on how to build an engaging and fleshed out monologue. *This event is exclusive to participants only. We're kick starting the journey to the Singapore Monologue Slam with a BANG! With our 60 participants all geared up and ready, the Mixer is great opportunity to get to know your fellow participants. With special guests Haresh Tilani (Ministry of Funny) and Claire Schapiro (SG Creations Etc. ), participants will get the opportunity to talk to these people one-to-one and ask them about their experiences in the industry. Facilitated by our producer Kamil Haque, expect an exciting and fun experience mingling with like-minded individuals. Food and drinks will be provided. ​*This event is exclusive to participants only. Complimentary to all SMS 2017 registered participants. Dates: Weekends in July and August. Exact dates to be confirmed. All participants are entitled to a Monologue Masterclass conducted by Kamil Haque, founder of Haque Centre of Acting & Creativity. 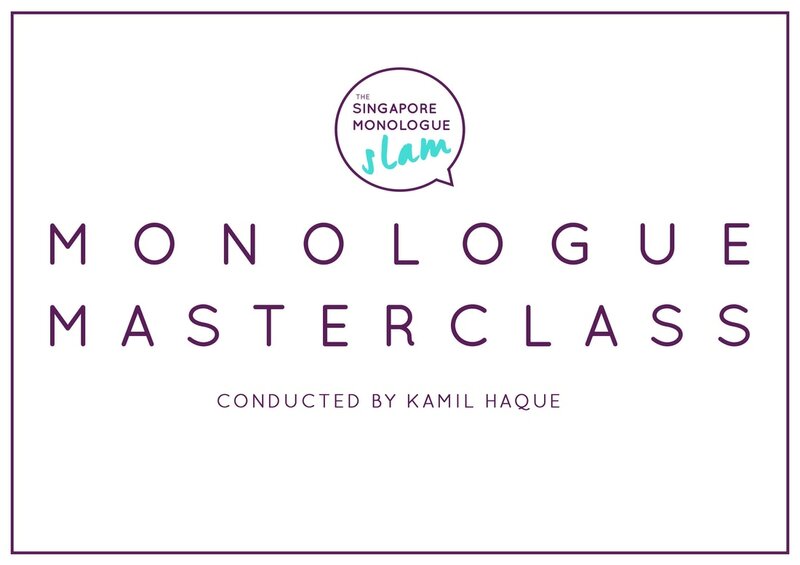 During the masterclass, all participants will receive practical tools and techniques to better interpret, rehearse and perform their chosen monologues. Kamil Haque is the first ever Singaporean and the only Asian at that time to be given the privilege to train and coach at the Lee Strasberg Theatre and Film Institute (LSTFI). He is currently the only coach in Asia experienced in teaching the Strasberg Method of Acting. He graduated top of his class from the American Music & Drama Academy (AMDA) with a BA Hons in Acting, and was the first student in half a century to be awarded Latin Honours for this subject. ​To date, Kamil has coached well over 1000 students, many of whom have appeared on stage as well as in film, television shows and national commercials around the world.